Speaker: Prof Kwandiwe Kondlo, Professor, Department of Politics and International Relations, University of Johannesburg. Date and Time; 8 May, 2019, 6-8 pm. The lecture will last about one hour and will be followed by light refreshments. 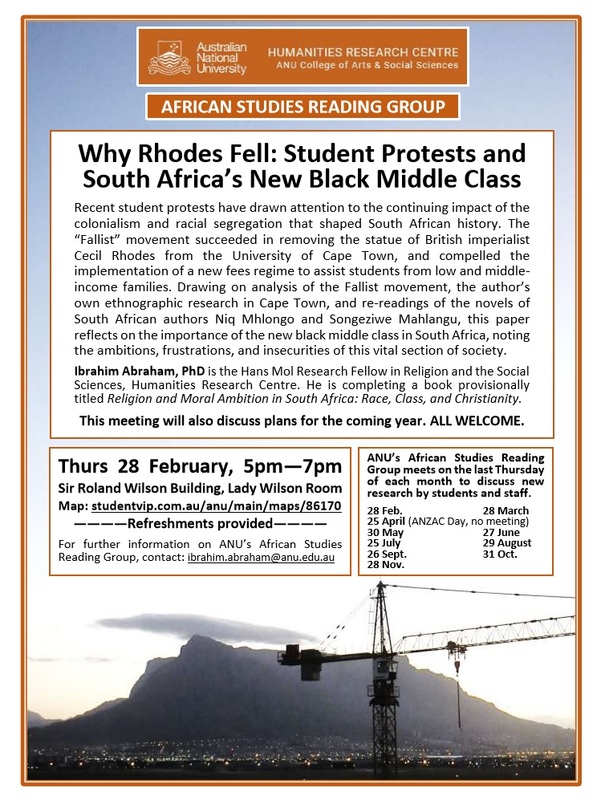 The lecture seeks to debate Nelson Mandela’s place in public memory. It will deal with several questions about the myths surrounding Mandela. These include, for instance, was Mandela a towering symbol of hope or was he a sell-out? Mandela, the ‘reluctant’ prince from the Tembu royal family; Mandela, the ‘black pimpernel’ operating from the ANC underground network before he was arrested, Mandela the ‘look alike’ of the ‘real’ Mandela ‘who died in Robben Island long ago’- these are aspects the lecture will cover to debate the mythical aspects of Nelson Mandela. The reality of Mandela as a genuine leader of the struggle for freedom in South Africa; a pioneer of South Africa’s nation building project based on values of non-racialism, non-sexism and inclusivity, will also be explored. ‘Sisonke Msimang will be in coversation with Chris Wallace, speaking about her powerful and challenging new book, The Resurrection of Winnie Mandela, which charts the rise and fall-and rise, again-of one of South Africa’s most controversial and influential political figures, the wife of one of the most famous activists of all time. Msimang situates “Ma Winnie’s” political career and legacy in the contemporary context, what she means today in social and political terms, by exploring different aspects of her iconic persona. ‘Ma Winnie’ fought apartheid with uncommon ferocity, but her implication in kidnapping, torture and killing would later see her shunned. In analysing Winnie Madikizela- Mandela, Msimang asks what it means to reclaim this powerful woman as an icon while honouring apartheid’s victims-those who were collateral damage and whose stories have yet to be told .Msimang shows us that activism matters, and that the meaning of women’s lives can be reclaimed. The Resurrection of Winnie Mandela is “a primer for young feminists and those interested in the politics of memory, reconciliation and justice.”Reading List South Africa. It is rare to hear from such a voice as Sisonke’s-powerful, accomplished, unabashed and brave.’-Alice Pung on Sisonke’s bestselling memoir Always Another Country. Sisonke Msimang was born and raised in Zambia, Kenya and Canada before studying in the US as an undergraduate. Her family returned to South Africa after apartheid was abolished in the early 1990s. Sisonke has held fellowships at Yale University, the Aspen Institute and the University of the Witwatersrand in Johannesburg and is a regular contributor to the Guardian, Newsweek and the New York Times. Her TED lecture on storytelling has been viewed over 1 million times. Dr Chris Wallace is an Australian Research Council DECRA Fellow at the National Centre of Biography, School of History, ANU and formerly a longstanding member of the Canberra Press Gallery. She is the author of several books including Germaine Greer, Untamed Shrew. Venue: Commonwealth Park Canberra Stage 88. Time: Saturday, April 6th, 2019, 10 am to 8 pm. Dr Martine Mariotti, a senior lecturer in the RSE, is seeking expressions of interest from postgraduate (honours level is fine, other levels will be considered) or final year undergraduate students to assist with a project. The basic skill required for this job is Excel with ideally some basic knowledge of Stata but this is not essential. Work will mostly consist of straightforward data manipulation in excel and could be extended to analysis in Stata. The project investigates the transmission of technological know-how in the South African gold mining industry in the late nineteenth century. We have data on mine output, ownership and location. The data are in separate files, the project is to bring the data together and put it in a form that is suitable for the statistical package we use called Stata. All the manipulation will be done in Excel, not Stata. While no prior knowledge of the contextual environment is required a general interest in the context once work begins will most likely help with the data work. If the candidate is willing and able we would extend the project to involve the statistical analysis. The position is for an initial term of 10 hours per week for three weeks in March/April 2019 with the possibility of extending the contract. Kirsty is an anthropology PhD candidate at the College of Asia and the Pacific, Australian National University. She is also affiliated with the Department of Sociology at the University of Ghana, Legon. The Australian Council for International Development (ACFID) is seeking a creative and propositional Communications and Policy Adviser to bring fresh ideas and new thinking to the secretariat, based in Canberra. Applications close on the 17th of February 2019. Dr Donald Kaberuka, Former President, African Development Bank and Rwanda’s Minister of Finance. 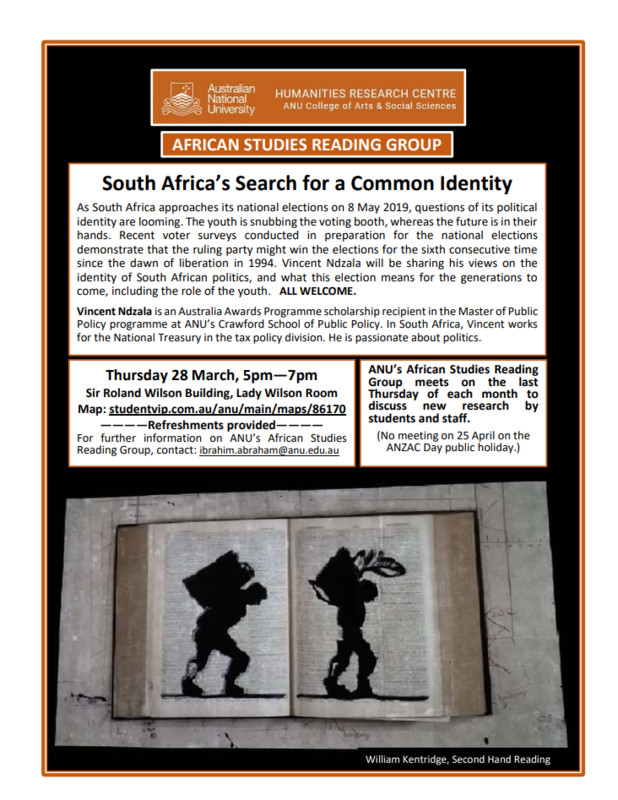 will be at ANU next week. 11am, Monday 18 February . Venue: the China and the World Boardroom.